Copyright 2018 - The Muckers. All rights reserved. The unauthorized reproduction of this recording is prohibited by federal law and subject to criminal prosecution. 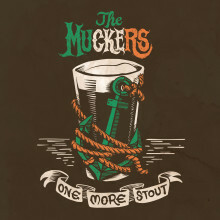 The Muckers are: Jeff Shaw, fiddle/mandolin/vocals; Brady Trulove, guitar/vocals; Randall English, bass/clarinet/vocals; Steve Lingo, drums/vocals; Dave Long, accordion/vocals. All songs engineered, recorded and mixed by Colt Bowen at Studio 45, Adairsville, Ga. All songs mastered by Miguel Scott at Tree Sound Studios, Norcross, Ga. All songs produced and arranged by The Muckers. Album art by Matt Murphree. Cover concept by Revbenjaminwhitehead@gmail.com. Photos by Brian Weaver. Music/lyrics by Jeff Shaw on Hellbound, One More Stout, Whiskey. Music by Jeff Shaw, lyrics by Jeff Shaw, Dave Long and Randall English on Day Drinking. Music by Jeff Shaw and Aden Paul, lyrics by Jeff Shaw on Drunker'n Cooter Brown. Music by Jeff Shaw, lyrics by Jeff Shaw and Mark Crehan on Molly Part II. Lyrics by Jeff Shaw, music traditional on Limonchiki. Let's All Go To The Bar by Ian Patrick O'Neil, John Joseph McCauley III and Robert Barry Crowell (Deer Tick). Black Irish by Peter Bernhard (The Devil Makes Three). Long Gravel Road by Cutthroat Shamrock. Old Black Rum by Bob Hallett (Great Big Sea). God Save Ireland by Timothy Daniel Sullivan.